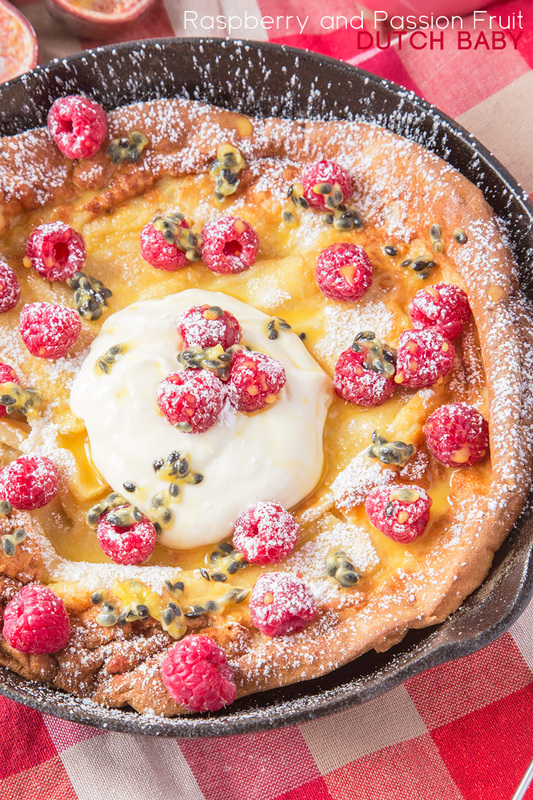 My easy and scrumptious Raspberry and Passion Fruit Dutch Baby is the perfect family breakfast recipe to make this Spring! Ignoring the slightly bizarre name; this is basically a giant, sweet pancake baked in the oven, in a cast iron skillet. 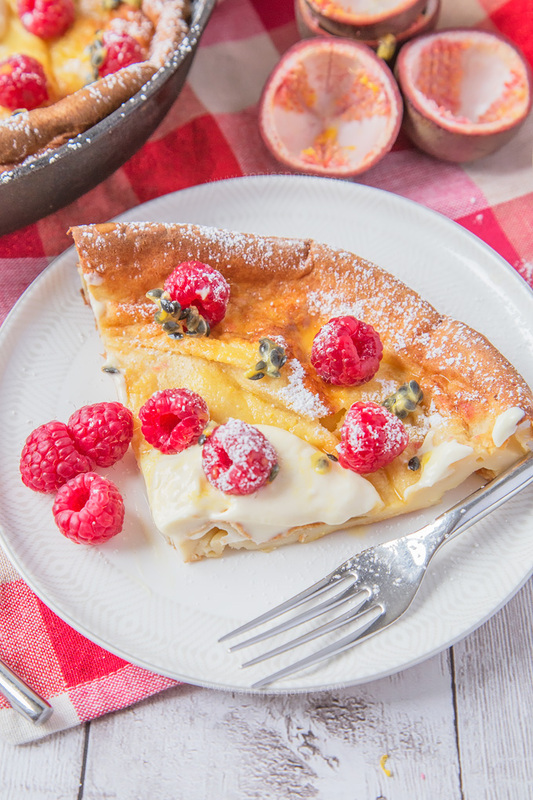 For this version, I added plenty of fresh raspberries and the pulp of three passion fruit and finished it off with mascarpone whipped with agave nectar. Oh yes. 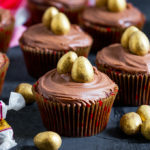 One super decadent, yet easy breakfast recipe to make your family this Spring. Or you could keep it for yourself… I mean, I won’t judge you! 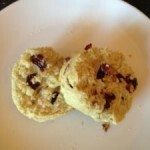 First off… can we talk about what a disaster I am whenever it comes to batter?! This is the second Dutch Baby I made because the first one almost burned the house down. Forgetting that for a second, it did taste amazing… It was just slightly singed around the edges. My ability (or lack of) with batter reaches far further than just Dutch babies; Yorkshire puddings (Popovers in the US), pancakes fried in a pan… I always make a horrendous, ugly mess. They might be yummy and edible, but photogenic? Not so much. Now, I know my oven runs hot, so theoretically, I should have learned by now that batter can literally go from golden to burnt in about 1 minute, so I should have been more careful. However, as per usual, I was rushing around doing 5 million things at once, it was the third recipe of the day and I put it in for 15 minutes thinking that every recipe I had ever seen said 20-25 minutes, so 15 minutes was being safe. Yeah… it was black around the edges, smoking and just plain ugly. So, into the bin it went. After I laughed at myself for how I seem to be the kiss of death for batters. Don’t let my stupidity put you off though, this really is an incredibly easy, utterly scrumptious breakfast/brunch recipe! And that raspberry and passion fruit top? Ohmygoodness. Sweet, tart, delicate… All the very best things fruit should be! 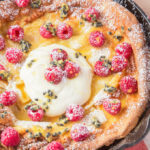 The second time I made this Raspberry and Passion Fruit Dutch Baby, I turned my oven down by 10C, (so it was probably the temperature it should have been) and only put the pancake in for 10 minutes before checking, then a further 5 minutes and then a final 3 minutes before it was gloriously golden, puffy and ready to be topped with raspberry and passion fruit goodness! Anyway, all you need to make this is a blender (or bowl and whisk) and a cast iron skillet. That’s it! You blend/whisk all the pancake ingredients together, pour the batter gently into a cast iron skillet, which has been warmed on the hob with 1tbsp of butter and then place it in the oven. Keeping watch as it doubles in size and becomes this humongous, puffy pancake. 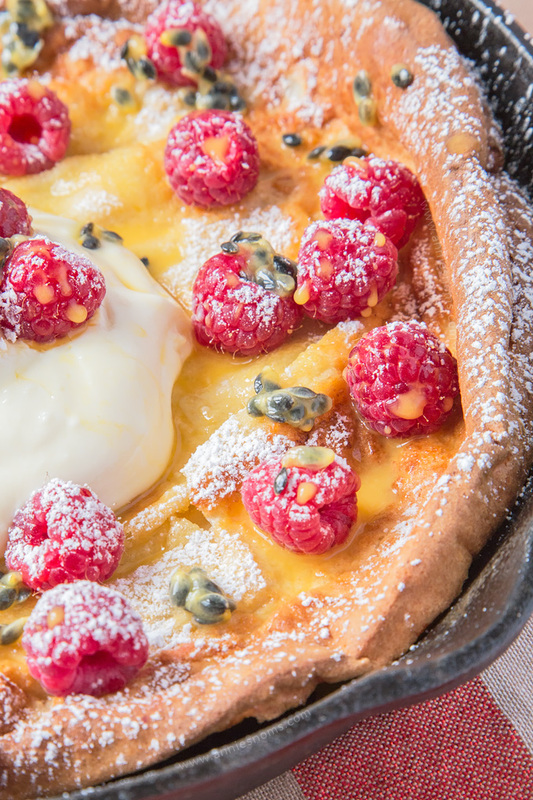 Once it’s cooled, top it with fresh raspberries, the pulp of three passion fruit and some sweetened mascarpone. After that? Dig right in. I didn’t even plate it, I just got my fork and in I went. This is SO DARN GOOD. I don’t know why I haven’t made a Dutch Baby before! The pancake is sweet, but not overly so, lightly vanilla flavoured and soft. Then the passion fruit adds a punch of flavour which compliments the delicate flavour of the raspberries. The sweetened mascarpone? Creamy, sweet, oh-so-good. 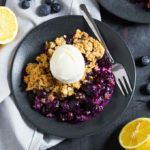 Man, you need this breakfast in your life! Preheat the oven to 210C/410F and place 1tbsp of butter into a 10 inch cast iron skillet. Place the skillet over a low heat to melt the butter, whilst you make the batter. Place flour, salt, sugar, vanilla, eggs and milk into a food processor and pulse until everything is combined and smooth, about 1 minute. *Alternatively place all of the batter ingredients into a medium sized bowl and then whisk until smooth and well combined. Blending the batter in a processor is preferable. Once the butter has melted in the skillet, use a pastry brush to brush the melted butter all over the skillet and up the sides. There will still be plenty of butter in the bottom of the pan, this is just to ensure the pancake doesn't stick to the sides! Pour the batter into the centre of the skillet slowly, it will combine a little with the butter and then there will be a small ring of butter around the edge; this is fine. Place in the oven for 15-20 minutes, keeping careful watch after 12 minutes, until pancake is puffy and golden around the edges. The middle will be a pale yellow, with a few golden spots. Don't be alarmed by how HUGE the pancake gets, it will sink as it cools! Remove from the oven and place on a heat proof surface to cool for at least 20 minutes; you can serve it warm or leave it to cool completely. I like to serve it warm. To serve: Place mascarpone and agave nectar into a small bowl and stir to combine. Spoon the mascarpone into the centre of the Dutch Baby. Sprinkle raspberries all over the pancake and then spoon the seeds and pulp of three passion fruit over the raspberries. Serve immediately. Oh yes indeed. 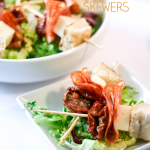 This sounds divine and absolutely perfect for a decadent summer brunch. Now I just need a cast iron skillet. 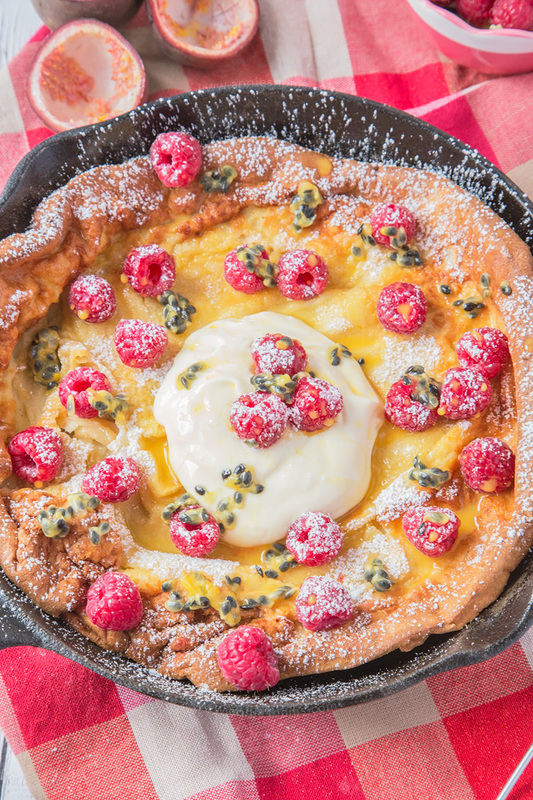 I love making dutch baby pancakes…they are perfect for weekend brunches. These sound fantastic. Thank you! 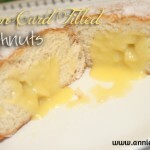 I can’t believe how easy they are, I’ll definitely be making them again! 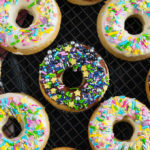 This looks like the perfect breakfast! Looks absolutely delicious! 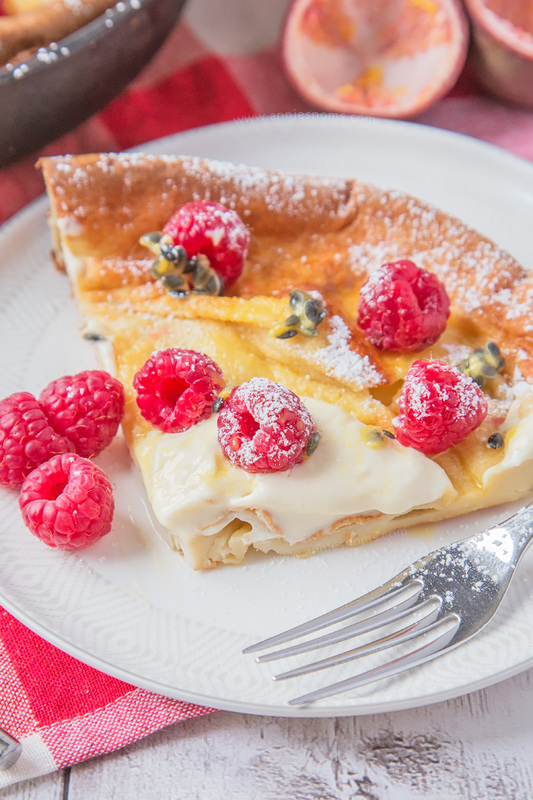 Raspberries, passion fruit and mascarpone, my goodness! It sounds and looks incredibly good! 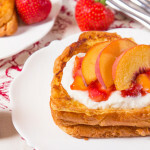 I’ve never heard of this before but it looks like something I need to make for a weekend breakfast! I have been wanting to buy myself a good cast iron skillet – I really wish I had my grandmother’s! Yes, the perfect weekend breakfast!! I got my skillet from TK Maxx and it’s great, couldn’t be without it now! I can so identify with the hot oven and burning the batter thing! I’m trying to get used to electric after decades of using gas. There are no gas lines in our area! So, I burn my stove top pancakes almost every time I make them! ARGH! Your 2nd attempt at the dutch baby turned out gorgeous, though, and you were vindicated 😉 I’ve pinned this for a future weekend. Oh my, this looks soooo amazing! Your colorful photos are awesome too! Pinned it and absolutely can’t wait to try this for a special brunch. Thanks! Honestly I am just happy it’s berry season again! Me too; best time of the year in my opinion!! I have yet to make a Dutch Baby Pancake! They look so awesome though! I love Dutch babies! They’re so quick and make a HUGE impression at any meal. This looks GORGEOUS!! It’s made a huge impression on me.